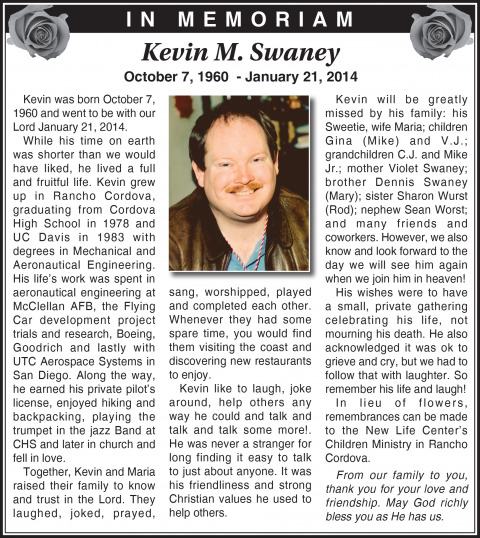 Kevin was born October 7, 1960 and went to be with our Lord January 21, 2014. While his time on earth was shorter than we would have liked, he lived a full and fruitful life. Kevin grew up in Rancho Cordova, graduating from Cordova High School in 1978 and UC Davis in 1983 with degrees in Mechanical and Aeronautical Engineering. His life’s work was spent in aeronautical engineering at McClellan AFB, the Flying Car development project trials and research, Boeing, Goodrich and lastly with UTC Aerospace Systems in San Diego. Along the way, he earned his private pilot’s license, enjoyed hiking and backpacking, playing the trumpet in the jazz Band at CHS and later in church and fell in love. Together, Kevin and Maria raised their family to know and trust in the Lord. They laughed, joked, prayed, sang, worshipped, played and completed each other. Whenever they had some spare time, you would find them visiting the coast and discovering new restaurants to enjoy. Kevin like to laugh, joke around, help others any way he could and talk and talk and talk some more!. He was never a stranger for long finding it easy to talk to just about anyone. It was his friendliness and strong Christian values he used to help others. Kevin will be greatly missed by his family: his Sweetie, wife Maria; children Gina (Mike) and V.J. ; grandchildren C.J. and Mike Jr.; mother Violet Swaney; brother Dennis Swaney (Mary); sister Sharon Wurst (Rod); nephew Sean Worst; and many friends and coworkers. However, we also know and look forward to the day we will see him again when we join him in heaven! His wishes were to have a small, private gathering celebrating his life, not mourning his death. He also acknowledged it was ok to grieve and cry, but we had to follow that with laughter. So remember his life and laugh! In lieu of flowers, remembrances can be made to the New Life Center’s Children Ministry in Rancho Cordova. From our family to you, thank you for your love and friendship. May God richly bless you as He has us.